Reach For A Dream celebrates the theme of Courage this year as its theme of Slipper Day, raising funds to aid children’s dreams. Every year Reach For A Dream gives hope to children fighting life-threatening illnesses through the fulfillment of their dreams. It is also expanding the reach of its projects nationally. On 10 May, Reach For A Dream encourages the public to take part in the fundraising initiative by purchasing a R10 wristband and wearing slippers for the day. You can purchase your wristband from any Pick n Pay, Wimpy or Dis-Chem store or any of our Reach For A Dream branches. 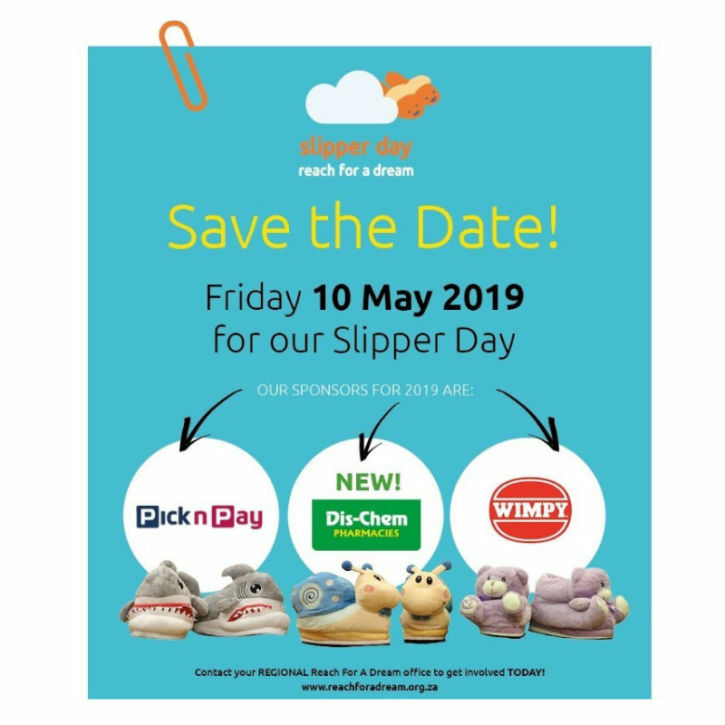 Wearing your R10 wristband and slippers will also get you a free coffee from Wimpy on Slipper Day, 10 May 2019. Last year Reach For A Dream helped hundreds of children experience their dreams. Vatsha Ayabonga experienced his first flight, Marlon Mohamed met his rugby idol, Patrick Lambie and Endinako Jack received her own laptop. Fulfilling dreams give parents hope and inspire children to believe in the power of what a dream can do. — CEO, Reach For A Dream, Julia Sotirianakos. The Reach For A Dream Foundation has positively touched over 3 million lives to date, since their inception over three decades ago. Scientific research has apparently shown how a number of diseases can be improved or ameliorated simply through emotions.